Some 30 years ago Gordon Tullock, in his capacity as Editor of Public Choice, made a pointed effort to motivate researchers to measure and quantify resource investments in rent-seeking activities. Despite Tullock’s identification of this aspect of rent-seeking as a significant gap in the literature and call to arms, this remains an under-studied topic of importance. Why is this? In our opinion, the answer is that, for a variety of reasons, measuring rent-seeking turns out to be very difficult. In this paper we identify and discuss several of the difficulties, both theoretical and empirical, although we concede that our treatment surely is not exhaustive. “…I have been perturbed by the difficulty in finding any actual measurable cost of that rectangle” (Tullock 1997, p. 149). We greatly appreciate the helpful comments provided by two anonymous reviewers, Matt Mitchell and Bill Shughart. The usual disclaimer applies. Hall, J., Matti, J., & Ferreira Neto, A. B. (2019). Rent seeking in the classroom and textbooks: Where are we after 50 years? 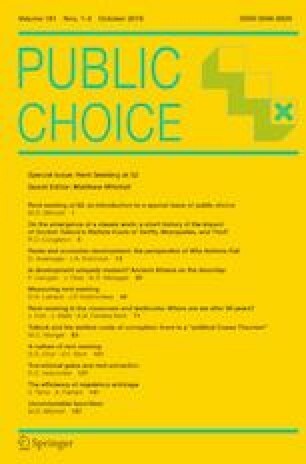 Public Choice. https://doi.org/10.1007/s11127-018-0563-z. Harper, J. (2014). 4 Million Words: the U.S. Tax Code is seven times the length of ‘War and Peace’. Washington Times, April 15. Accessed May 18, 2017. http://www.washingtontimes.com/news/2014/apr/15/4-million-words-us-tax-code-seven-times-length-war/.